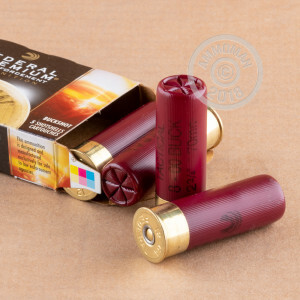 Designed for the rigors of law enforcement use, these shotgun shells from Federal Premium Ammunition will also serve well in a home defense or hunting role. They use Federal's FLITECONTROL rear-breaking wad, which keeps the pellets grouped as they leave the barrel and only gradually disintegrates past 10 feet to generate the shot pattern. This improves midrange accuracy, enhancing knockdown power against targets and reducing the chance of collateral damage. The copper-plated pellets retain their shape better than bare lead shot, further improving consistency. 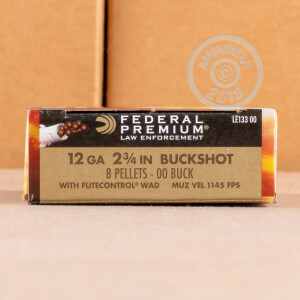 This ammo comes from Federal's main production plant in Anoka, Minnesota. This 250 shell case contains five large boxes, each of which contains ten small boxes, each of which contains five shells. It's like Russian dolls, but with ammo! 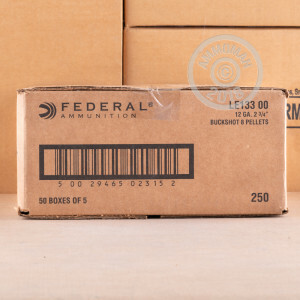 Buy $99 or more in ammo from AmmoMan.com to get free shipping direct to your door. Extremely tight pattern out to 25 yards. Closer is akin to a slug. A bit more $$ per round but worth it if you ever need it. I bought these shells to store until I need them. That said, I would definitely order more ammo from this site if and when I need it.